Home » News & Articles » How about a beer with your iPhone? 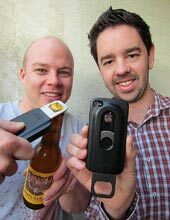 You can do a lot with an iPhone these days — text, take pictures, surf the net, and even make a phone call..
And soon, thanks to two Australian entrepreneurs, you will be able use it to open a bottle of beer by way of the “Opena,” a hard plastic case that fits over the iPhone and is equipped with a slide-out bottle opener, reports the Daily Mail. Of the poanlpy of website I’ve pored over this has the most veracity.